Every year the high school students have the opportunity to travel together to different parts of Honduras. This is the trip the students wait for all year. This year was no different, the students have been talking about it since before Christmas and we only just went February 23rd-25th! I will admit that having heard about the trips last year I was also very excited and had been thinking out the trip for a while now. Unfortunately, because of the cost of the trips there are a number of students who are not able to attend and some who choose not to attend, but there is still a good turn out of kids and all the students generally travel on at least one of the trips during their high school years. The way these trips work is the grade 7 and 8 classes travel every other year to either to Copan and the Mayan Ruins or to Omoa and Puerto Cortes. The grade 9, 10, and 11 students travel, on a rotating basis, to either Roatan, La Ceiba and Cayos Cochinos, or Utila and La Ceiba. The English and Spanish maestra guia (guide teacher) assigned for each grade accompanies the students on these trips. As the Grade 9 English maestra guia I had the pleasure of traveling with approximately 30 students ranging from grades 9-11 to La Ceiba and Utila for their three-day educational trip. La Ceiba is located on the northern Caribbean Coast and Utila is the third largest of the Bay Islands. The trip was only three days�three of the longest, busiest, hottest, exciting, most adventure filled, rewarding, roller coaster days I have had here in Honduras. We began out adventures at 4am when we left the school packed on a bus and each day we were up by 5am each morning getting started on our many activities. The first day after our long bus ride we hiked part way up Pico Bonito (one of the highest peaks in Honduras and part of a national park). The hike was beautiful through the mountain forests following one of the rivers that flowed down the huge mountain. Our final destination was a beautiful waterfall part way up Pico Bonito, I was very content with the waterfall when I found out hiking the whole mountain takes an entire day! The rest of the day was spent visiting a butterfly and snake conservatory, settling into the hotel, a short visit to the mall, and after having some devotional time taking a dip in the pool. The second day we were up bright and early again at 5am packing up all of our stuff and preparing to get on a small boat (called a lancha) and head to Utila. The boat ride was very bumpy and wet. 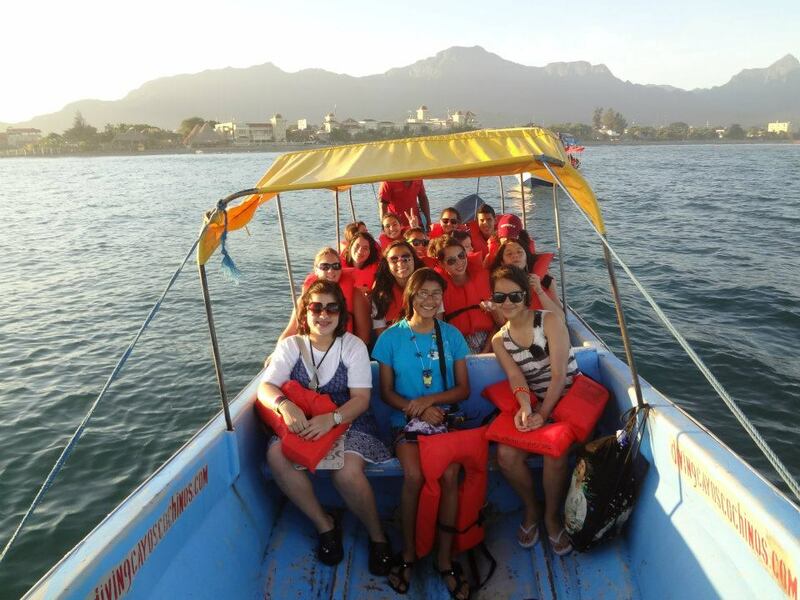 Your probably thinking, "Yeah you�re traveling on the ocean in this small 12 seater boat. Of course you are going to get wet and practically whip-lash.� Well you are wrong apparently I chose the wrong boat everyone else in the other two boats were dry as a bone and didn�t seem to think the ride was that rough. Oh well such is life the rough ride and soaked clothes were all forgotten the moment I saw those fins in the water�.dolphins!!! Yup the boat driver stopped the boat in the middle of our trip and as we all looked around to see what was wrong we saw dolphins all around us close enough to touch, jumping out of the water and swimming under the boat, we were surrounded. All of us stood up and screamed pointing at all the dolphins, I felt like a little kid on Christmas it was one of the coolest sights I have ever seen in my life! After all that excitement once we arrived on the island, the rest of our day was spent doing a lot of walking to old airports, restaurants, a beautiful recycling adventure land called the Jade Seahorse; and we also had the opportunity to go snorkeling (right off the beach you didn�t even need to take a boat out anywhere). Utila is that it is the island known for its scuba diving. The coast is lined with dive centers and schools for diving, etc. The majority of the population on Utila is white (gringos) who have either settled here or are vacationing and wanting to enjoy the hippie island atmosphere. There are very few cars and trucks on the island as most people travel either by foot, motorcycle, golf cart, or four-wheeler. It is a very unique place that I have traveled to before and I have always thoroughly enjoyed the relaxing ways of the culture here. The island life on Utila is a culture all its own. Our final day began bright and early at 5am again, leaving us all low on sleep. After our boat ride back to La Ceiba we headed to one of my favourite parts of the trip, this university which was built on this land used as a Genetic Bank of Plants (UNAH � CURLA). Here we were given a tour of part of the 31 hectares of land containing plants of many varieties from around the world. The university student use these plants to run experiments on to find out a number of different things such as medicinal values of plants, if the plants are at all fatal, etc. We were introduced to one plant that is the most fatal plant on the property. If you ate it you would die within 15 minutes! No ifs ands or buts, if you eat it you die. I found it very interesting to learn about all the different plants many of which I have never seen before. I also had a boost of confidence in my Spanish skills since the entire two-hour tour was given in Spanish and I was able to understand almost all of it! The final stop on our trip was the airport in La Ceiba. Here we were taken up into the flight command tower where we were permitted to walk outside around the top of the tower to watch a plane flying in. It was also pretty cool, honestly some of the things we did I think I appreciated more than the students did.